This thoroughly revised edition of the acclaimed Using German provides guidance for those who have already acquired the basics of German and wish to extend their fluency and confidence. 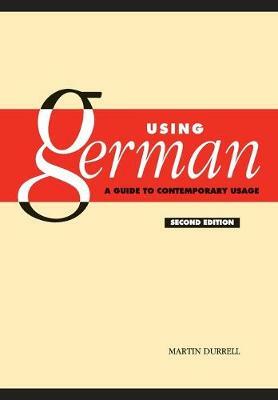 Focusing on the particular needs of the English-speaking user, it incorporates important information on recent trends and changes in the German language, including the 1998 spelling reforms, and on style, register and regional variation which are often ignored by conventional textbooks. * Designed to promote the fluency and accuracy vital to effective communication * Tailored to the needs of the English-speaking user * Clear format for ease of reference * Reflects the current state of the German language * Provides information on regional variation * Highlights problems of register and style * Important section on vocabulary extension, with index for efficient access * Invaluable to intermediate-advanced learners and anyone requiring up-to-date guidance on points of grammar and vocabulary.